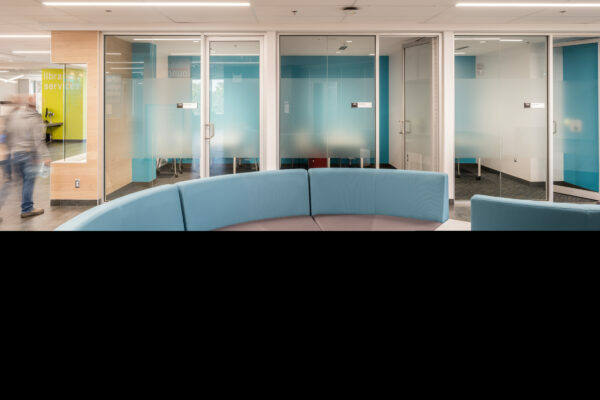 FBM has long enjoyed a productive professional relationship with Dalhousie University, working on a number of diverse projects over the years. 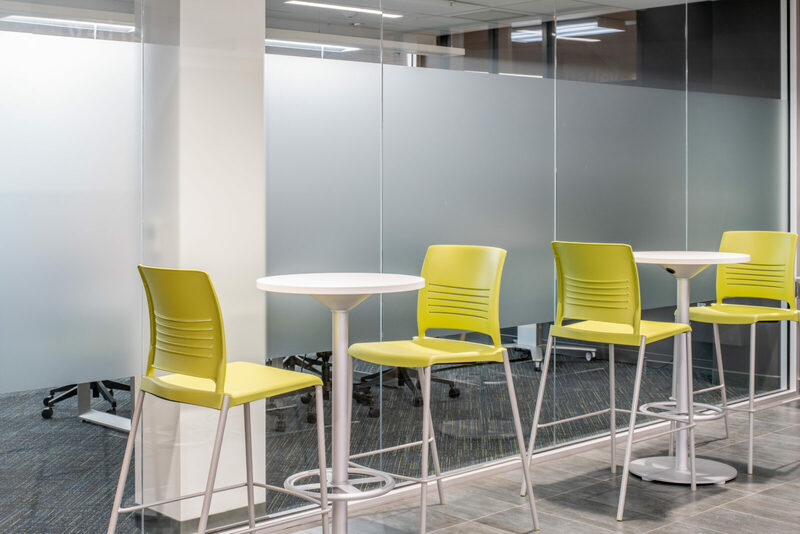 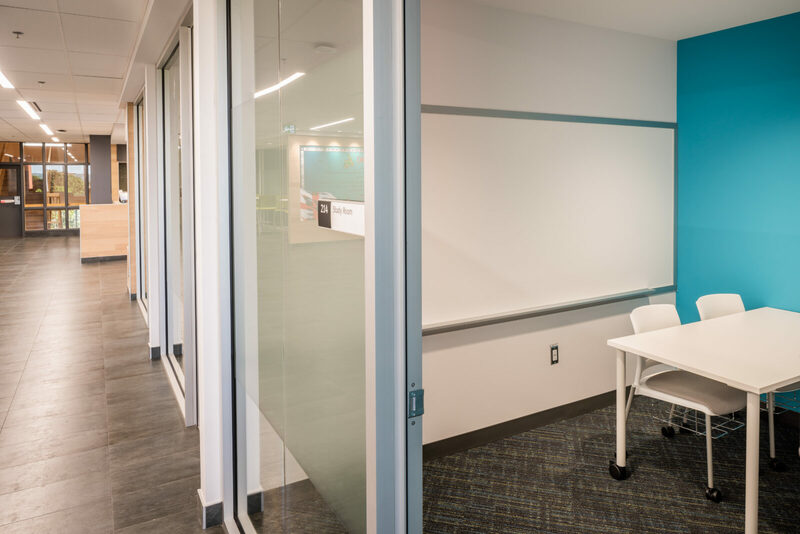 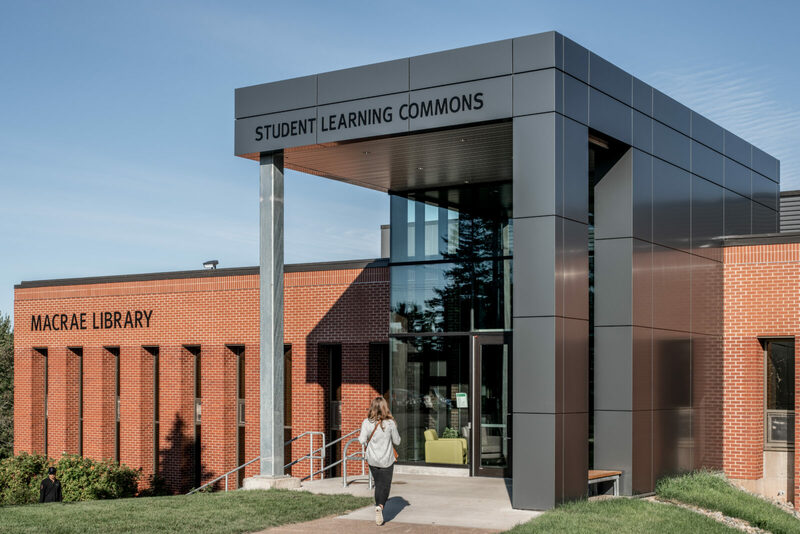 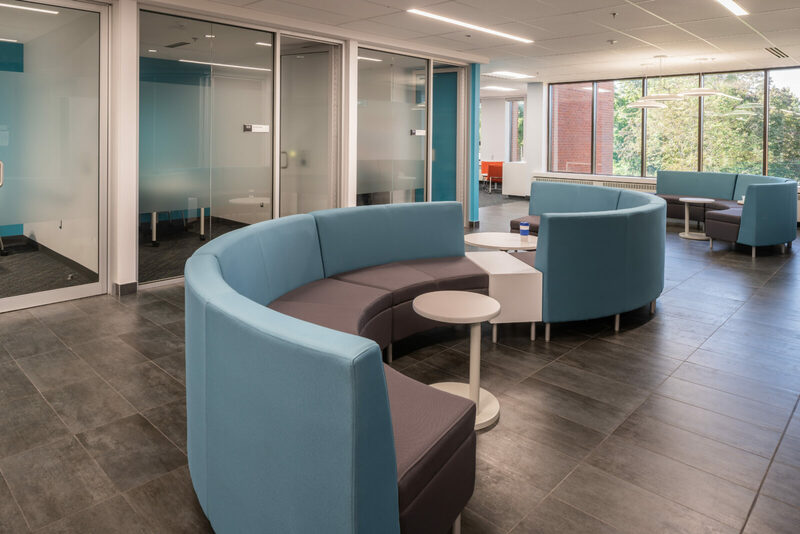 Most recently, the new Student Learning Commons at Dalhousie’s Agriculture Campus, effectively demonstrates the value of FBM Architectural and Interior Design collaboration and their skill and enjoyment in developing creative content. 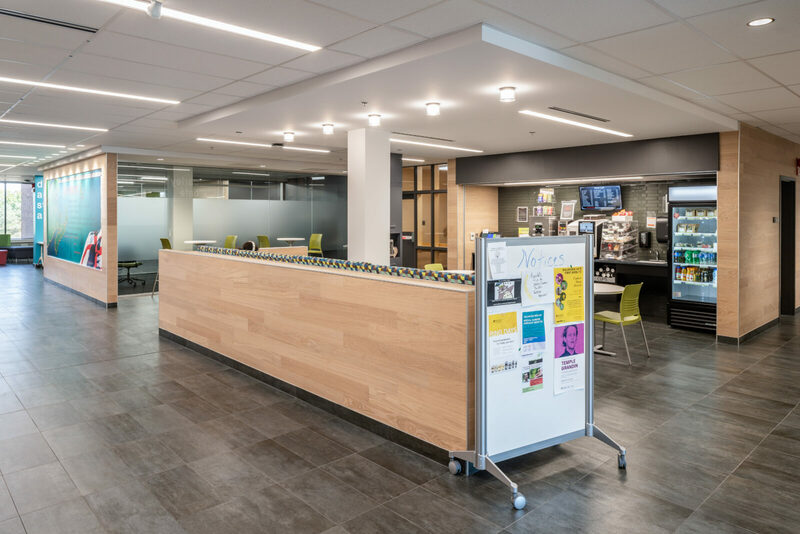 The project objective was to repurpose an underused floor of the MacRae Library for a long awaited centre for student and faculty activities on the Agriculture Campus. 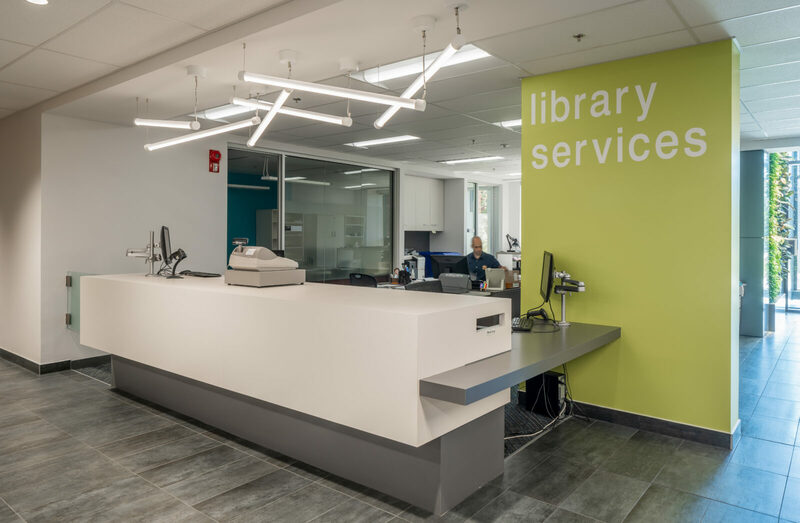 The space needed to serve a multitude of tasks, including Library Services offices for MacRae staff, Dalhousie Student Association administration offices, multipurpose conference and seminar space, social gathering space, group study rooms and commons and a mini coffee bar / snack shop. 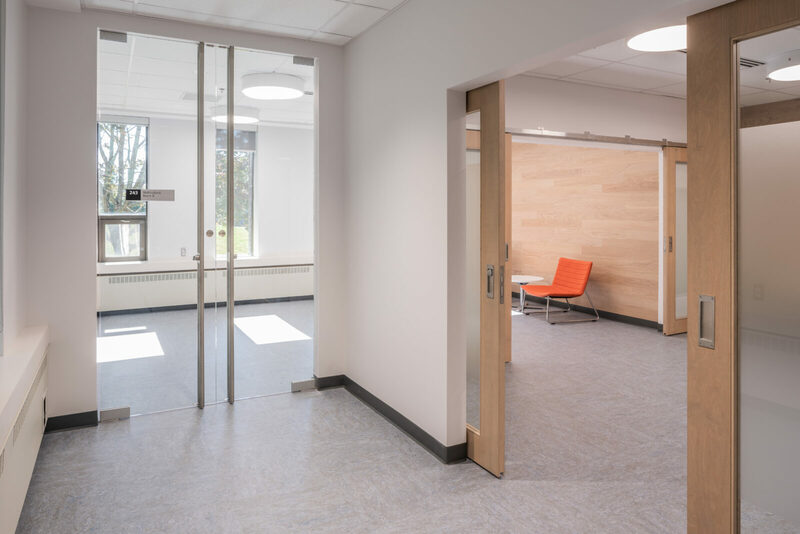 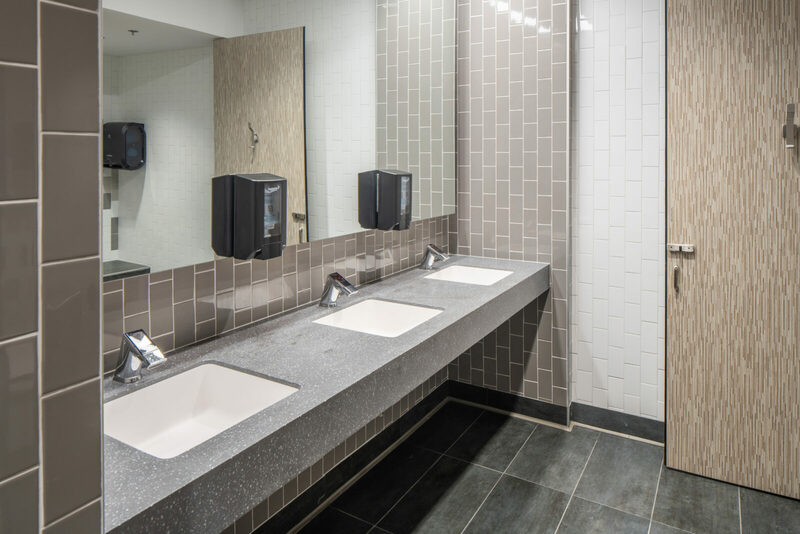 The facility was to be punctuated with the addition of a new entrance facade to proudly identify the building and facilitate donor recognition opportunities. 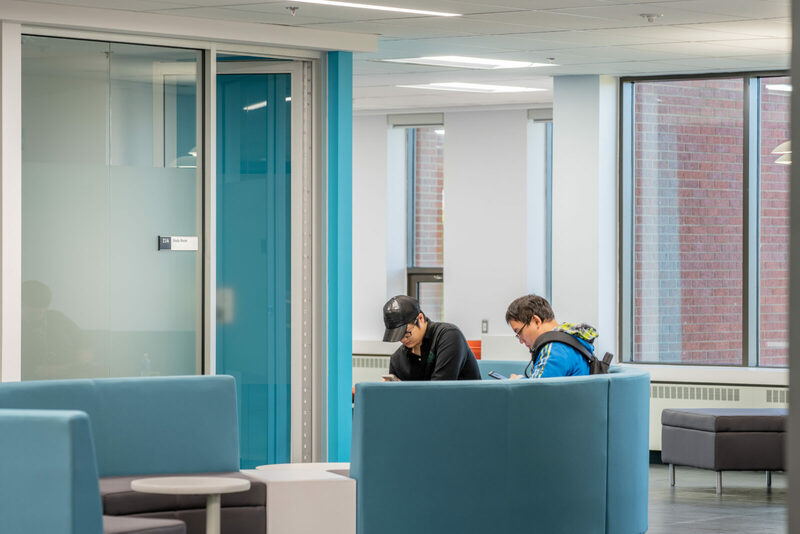 Dalhousie University supports a culture of inclusion and diversity. 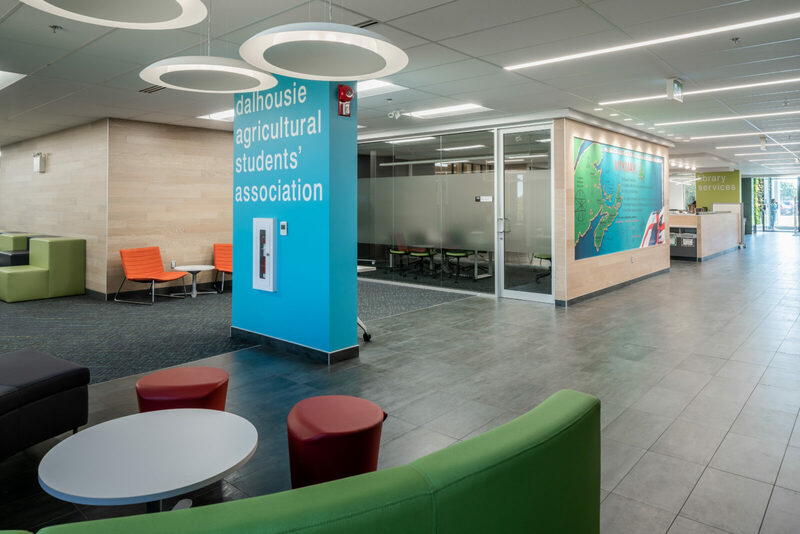 FBM developed spaces to communicate this powerful message through a flexible multicultural centre with meditation and smudging rooms, reconfigured washrooms for non-gender use and foot bath ablution stall, a large central display area for indigenous information and an exhibit area to honour the historic agriculture heritage of the area. 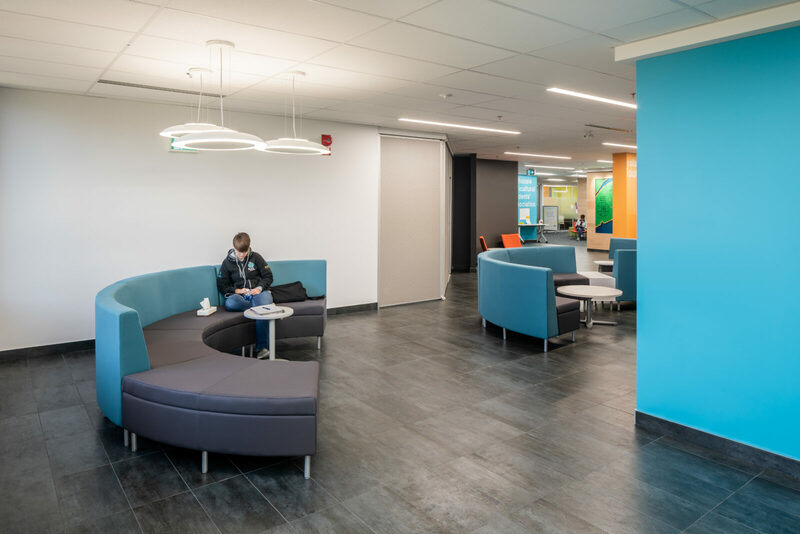 FBM’s team envisioned the beautiful rural setting as a primary feature of the interior. 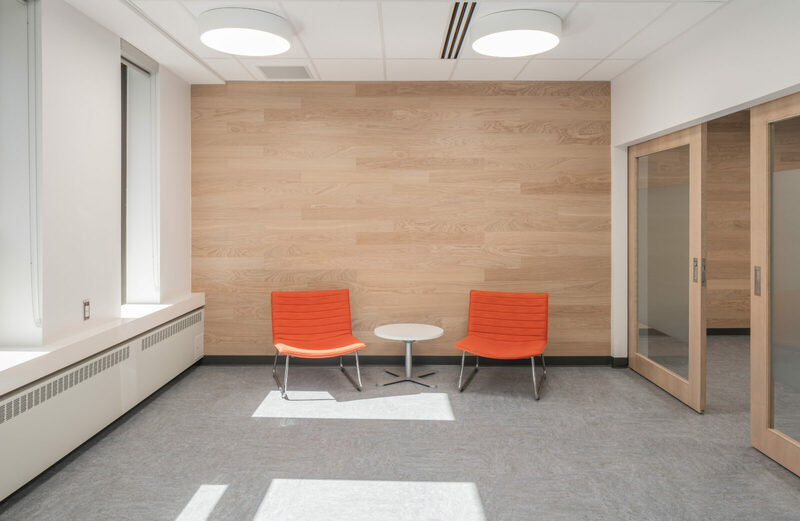 As soon as people enter the space they are gifted with openness, natural light and unrestricted views from most perspectives in the floorplate. 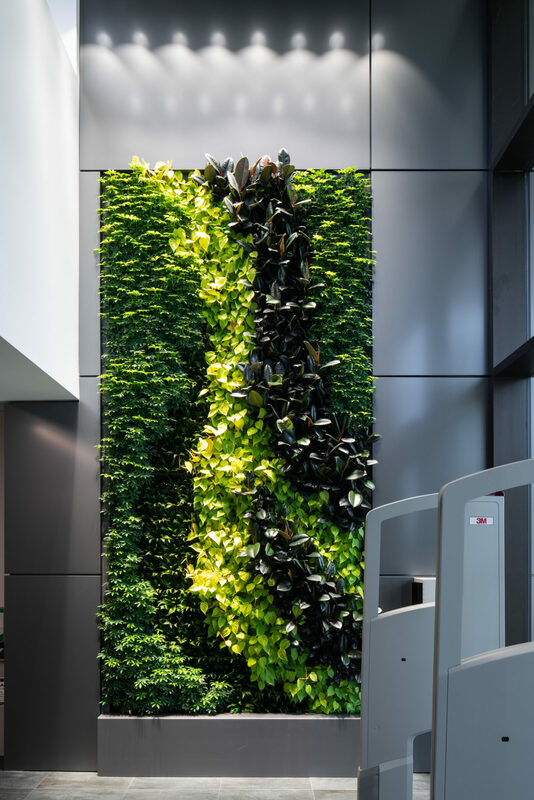 The double story glass entrance lobby brings the outside in with a full-height green wall. 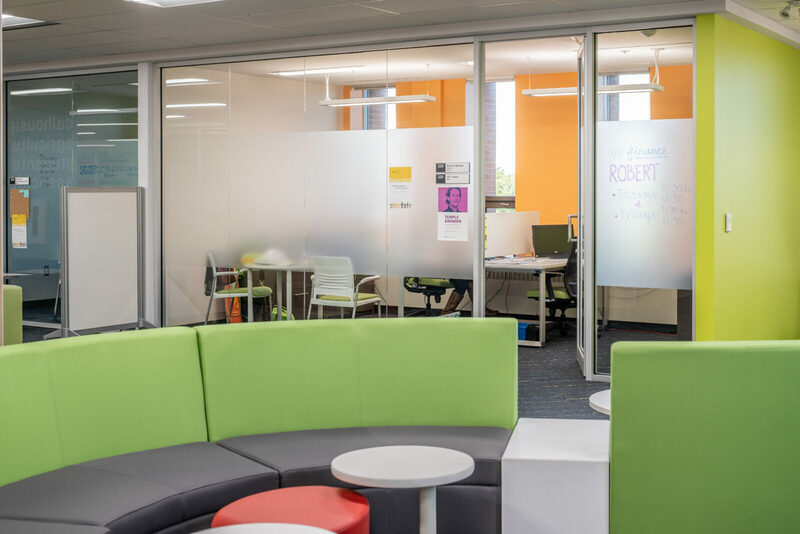 The Interior Design and Architecture teams at FBM took on the task of a tightly programed project and created an inviting and energetic place on campus for students to gather socially, share information and learning, and enjoy networking and support.